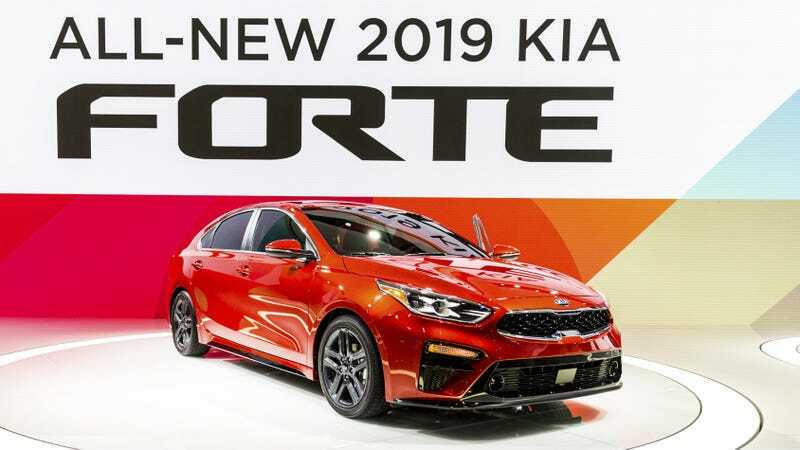 Kia brought a new 2019 Forte sedan to the Detroit Auto Show. Now, it has an optional CVT—confusingly reffered to by Kia as an “IVT,” more on that in a moment—and its engine runs on the Atkinson Cycle. It also copied enough of the Kia Stinger’s look to glow up and be kind of hot. But beyond having more storage space than an incredible high performance two-seat supercar, the new Forte sports a 2.0-liter inline four-cylinder engine that utilizes the science of the Atkinson Cycle to get a combined 35 mpg, Kia claims. The Forte still makes 147 hp and 132 lb-ft of torque, and comes standard with a six-speed manual with the option for a CVT that Kia calls an IVT (the “I” stands for intelligent and is essentially meaningless). One difference is the use of a chain belt to minimize the “rubber band” feel of a CVT, though Kia still decided to give it fake gear changes. Sitting in the car, the touchscreen is easy and comfortable to navigate, with a nice little shelf to rest your palm, which is a bigger deal to me than I thought it would be. Other systems, like the massive 12-inch touchscreen in the new Ram 1500, just leave your hand hanging there like it’s unimportant. Kia knows your arm comfort is important. The system comes standard with Android Auto and Apple Carplay, which is probably the best way to go. The Forte is also available with a suite of safety features like lane-keeping, blind-spot monitoring and adaptive cruise control, with forward collision avoidance as standard. The new Forte is apparently super fuel-efficient, available with a six-speed and a nice-looking alternative to the Corolla and Civic. No pricing was announced, but we should find out soon enough before the car goes on sale later this year.